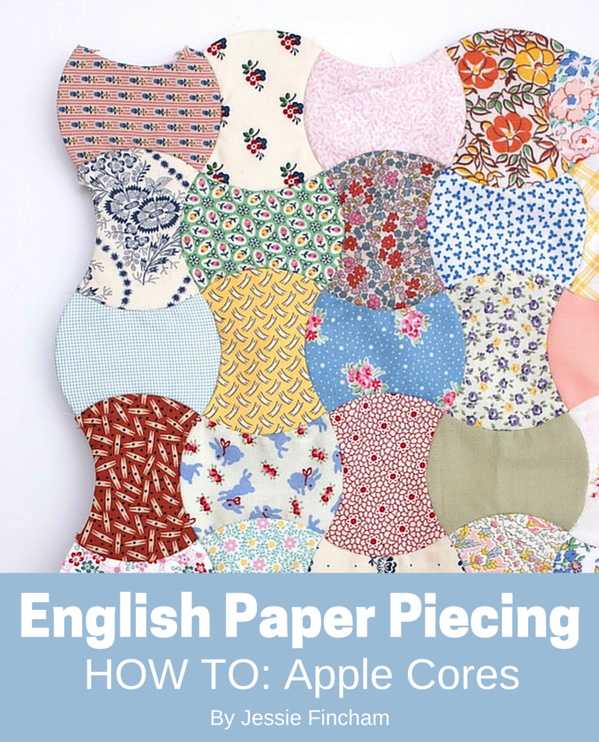 I'm back with part 2 of my guide for working with apple core shapes using the English paper piecing method. So today we're going to be joining our shapes together. It can look a little bit intimidating due to the curved nature of the shape, but it's really quite simple once you have a little practise. Gather your supplies; including your basted apple core shapes, needle, thread and scissors. I've recently switched to using Bottomline threads by Superior for EPP, and I can't recommend it enough. 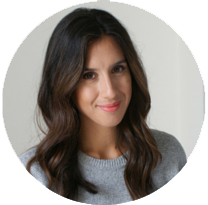 Take a length of thread (no longer than your arm span, to avoid getting tangled up), thread your needle and knot the end. This is where you join your shapes together. So place your two apple core pieces right sides together. Can you see where I've flipped these shapes? I'm going to sew right along those two opposing curved sides are, all we have to do is just adjust how we hold the pieces as we sew. Start with needle in one side and slide it through the opposite piece. Take the needle back through your starting place and repeat. I like to do this at least 2/3 times to start off and make things nice and secure. Bleugghh please ignore my non-manicured, 'crafty-workers' hands folks ;-) these were some up-close shots! Now with your pieces still held in the same position, begin whipstitching your shapes as you would do your regular straight-edge shapes (previous tutorial here). TIP: I do a lot more stitches per inch with curved shapes to ensure there are absolutely no gaps in my work and ensure correct alignment. Once you reach the point above; where the curves are separating in different directions. Stop. Re-position your shapes so they are lying at wide angle apart, almost lying flat - but not. TIP: My technique for a neat non-visable stitch is to place your (non-needle holding) middle finger underneath the section where you are sewing, use this as a balance to hold your pieces correctly. I've actually moved my thumb out of the way in the above photo so you can get a clear view of my stitch and my middle finger underneath holding the position - but I do like to have my thumb exactly where the needle pokes out on the opposite side. I do this to guide my stitches and be sure I'm 'eating' into the fabric evenly with each whipstitch. I find apple cores to be a very forgiving shape for not being visible from the front. Due to the shapes lying quite flat as opposed to the normal way of placing two shapes right sides together and whipstitching tightly, here you are almost skimming the fabric so you aren't 'eating' into the fabric very deeply, which is generally the problem when stitches are visible from the front. Whipstitch all the way along the side, re-positioning as you need. Be sure to pull the thread firmly as you go to keep a tight seam. Once you reach the end, take 2/3 anchor stitches (just as you did at the start). You'll want to go through the two folds here to make everything secure. This is why we paid extra attention to basting the corners of the apple cores; so we have nice crisp folds so the shapes are the same size and it matches up accurately. Knot your work to finish the seam. Your first pieces are joined! As a general rule, I sew apple cores in rows adding in one shape at a time. Once you have your row complete you will want to add more rows one by one. I like to remove the papers once I have all sides joined so I can move my work more freely. I lie my work on a flat surface and work the seams with a whipstitch just as I did when joining the individual apple core shapes together. Once you come to an 'intersection', where four shapes meet together. Catch your needle through the first folds of the lower shapes, repeat 2/3 times. Then repeat for the other two folds of the upper apple core shapes. This will make everything really secure and very neat from the front. Once you pass the 'intersection', pull the fabric tails or folds out of the way to keep everything neat as you continue whipstitching. This is how your work will look from the front. I hope my guide has helped you on your future apple core adventures! * When basting your shapes, ensure you have nice tight, folded corners. * Don't snip into the curved edge too deep, otherwise your fabric will weaken and tear. * Use a neutral matching thread, if in doubt choose grey! * Remove paper templates once all sides are joined to allow more movement. I'm using the 3" apple core templates for this tutorial. You can find them in my shop here. Thank you for this tutorial, there are lots of useful tips here. 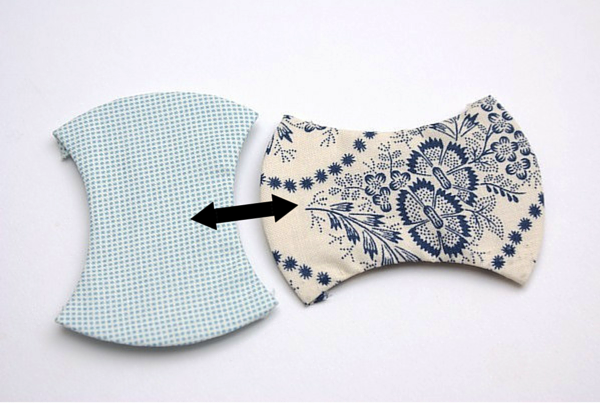 I love EPP but haven't tried this shape yet. I have never tried EPP, but have always wanted to. After reading your tutorials, I think I am ready to try a small project. Thank you for sharing and have a wonderful creative day! Great tutorial and a wonderful result! Have a beautiful week-end! I have not tried this shape yet. Definately will refer to your tutorial again if I started one.